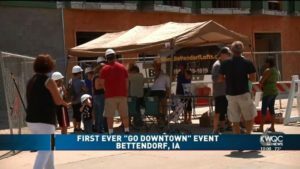 On June 2nd, the City of Bettendorf hosted the first ever Be Downtown event where local businesses participated in free giveaways and other events. The Be Downtown event spanned most of downtown Bettendorf, and we set up right in front of The Bridges Lofts. We invited several other businesses to join us at our street party, Crawford Brew Works, Hy-Vee, Bereskin Art Gallery, Exit Realty, Donuts and More, Musicians like Riding Atlas, Ariel McReynolds, and Stevie J, and Family Inflatables Bounce House. Many of the businesses offered samples and sold their products, while we gave Hard Hat Tours of The Bridges Lofts. We showcased two units on the 2nd floor, in the middle of the building overlooking the pool area. One of the units was a one-bedroom floorplan and the other was one of our few, two story units that has the bedroom on the 2nd story. It was amazing to see the progress of the building and it was great to finally be able to show the public some of our vision. We had a great turn out and we got to speak with many people who have reserved a loft of their own, and many new people alike. We held tours from 1-4pm and its was nonstop from start to finish! It was great to be able to show everyone some of what the building will turn into and how truly enthusiastic we are. 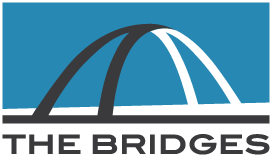 We are definitely excited to look ahead and see what will come next for The Bridges Lofts!